Fr. Thaddeus BK Tran was born on March, 15, 1956, in Hue, South Vietnam. After the fall of S. Vietnam to the Communist North in April, 1975, he arrived in the U.S.A. as a war refugee, and resettled in Muskogee, Oklahoma, June, 1975. Hence, he often refers to himself as “An Okie from Muskogee.” From 1975 to 1987, Fr. Thaddeus, as he now would like to be called, attended St. Gregory College, Shawnee, OK; OSU & OCU, Oklahoma City, OK, respectively. After nine years working for AT&T Technologies, he quit his job in December, 1987 to accept the Lord’s calling to the priestly vocation. He was accepted by the Diocese of Peoria, IL, and subsequently sent to Holy Apostles Seminary, Cromwell, CT, for his priestly training. After his ordination in May, 1992, Fr. Thaddeus had served the people of God in Chillicothe; Morton; Rock Island, Matherville & Viola; Walnut & Ohio; Chatsworth & Forrest, respectively. 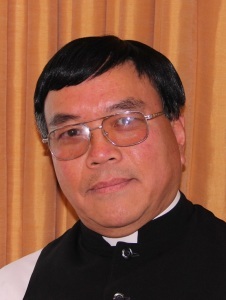 In June of 2013, Fr. Thaddeus received permission from Bishop Jenky, CSC, DD to moved to Melbourne, FL , where he served God’s people at the Ascension Catholic Church, a big and very busy parish with over 3,000 Catholic families from Sept. 2013 to December 2017. Now, as the newly appointed parochial vicar of St. Patrick Church, Washington, IL Fr. Thaddeus is looking forward to serving God’s people with love and devotion.